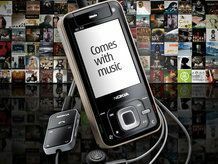 Nokia has officially released the Comes with Music service at its 'Remix' event in London, which it hopes will change the face of mobile music downloads forever. The first phone to carry the service will be the Nokia 5310 for a PAYG option, which will debut in the UK on 16 October and will be available exclusively from The Carphone Warehouse. It will cost £130 from TCW, which means music for the whole year, and will also allow you to use the service through the Nokia N95 and 5800 XpressMusic on contract shortly. Apparently EMI has joined the party, along with Sony BMG, Warner Music and Universal... though we thought we knew that already? Nokia is also joined by a number of independent labels for the UK launch, including The Orchard (adding 1.3m songs to the catalogue) and Ministry of Sound among others, offering 100 per cent of chart coverage. Initially it will allow one year's downloads onto mobile and PC, which users will be allowed to keep once the year is up. Each track will be heavily DRM-ed of course, but then again, would you expect anything else? There will also be an 18-month option for those on a contract of the same length, and Nokia will be launching more should a need arise. Songs will obviously come from the Nokia Music Store, and can also be synced back to the PC for storage too, in case you lose your handset. The service will also be rolled out to other countries soon... so watch this space.